The Bioproduction/Separation Core provides state of the art facilities for fermentation and separation/purification of biomolecules. The facility has instruments at a variety of scales, that enable parallel high-throughput culturing for optimizing conditions. Mid-scale production is also available for synthesizing larger quantities of biomolecules. 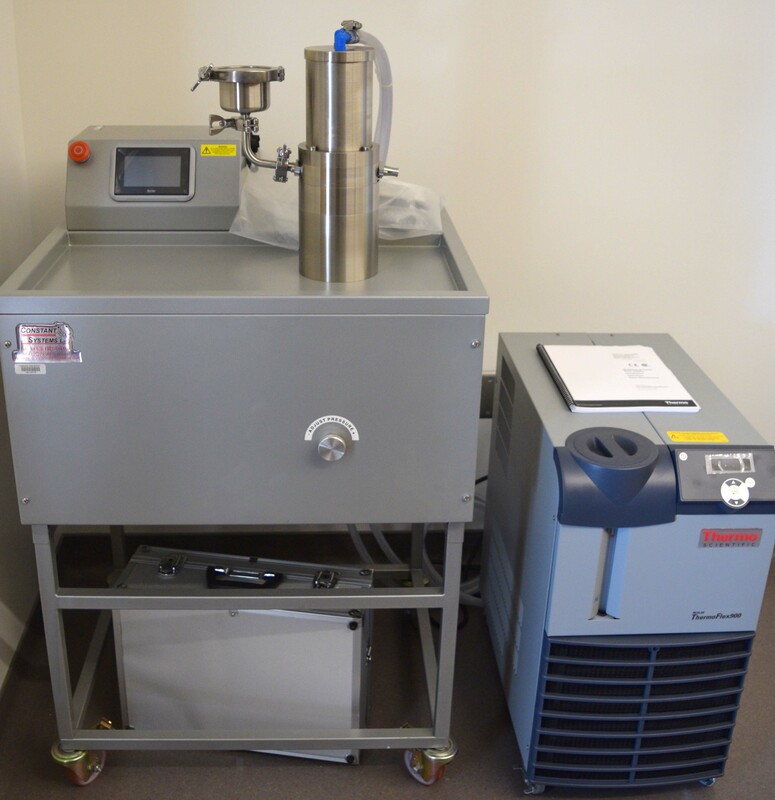 Protein separation units and a tangential flow filtration unit are available to purify and formulate the molecules of interest. In addition to the bioreactors, the laboratory houses some basic items needed for microbial culture including laminar flow hood, autoclave, incubator shakers, etc. A list of fermentation and separation instrumentation is found below. 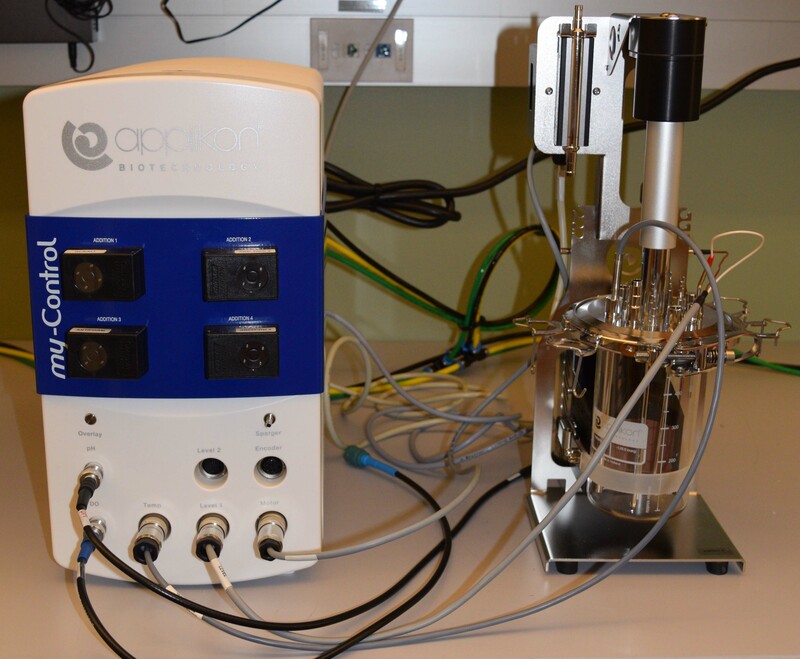 The lab has a 3L and a 15L bioreactor controlled by Applikon’s ez controllers. The ez-Control is an easy to use system for bioreactors and fermenters that accurately controls for pH, temperature, Dissolved Oxygen (DO), Foam/Level and Agitation. The color touch screen interface guides the user through the operation. The adaptive control features allow the user to focus on the process while the controller keeps tight control on the important process parameters. 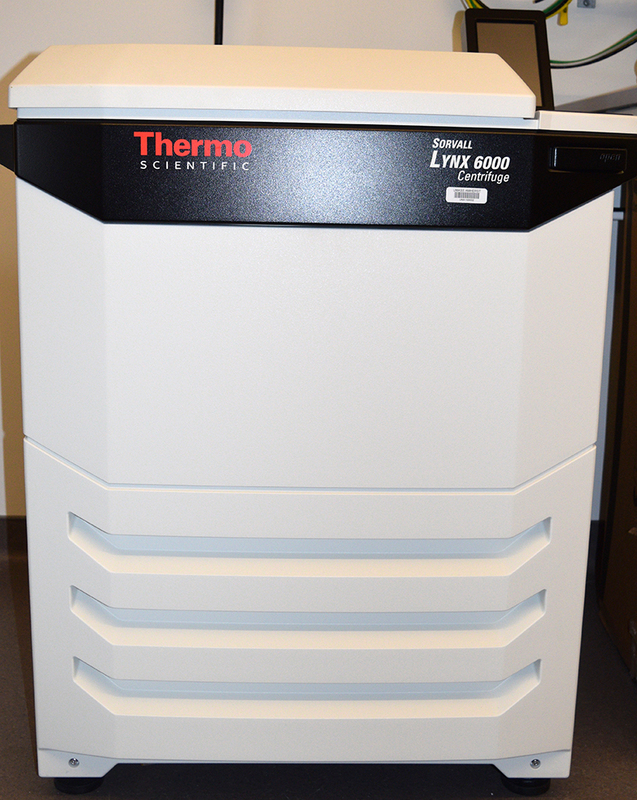 The lab has a Thermo Scientific™ Sorvall™ LYNX 6000 Superspeed Centrifuge for high-speed separations. The Lynx has a maximum speed of 29,000 rpm (100k xg) with a temperature range of -20 to 40°C. There are 2 fixed angle carbon fiber rotors that allow volumes from 14x50 mL conical tubes up to 6x1 liter to be processed. A swinging bucket rotor allows for up to 4x1 L volumes. The CF cell disruptor in the core is a “French press” type system to lyse cells and extract expressed proteins. Once a sample is drawn into our high pressure cylinder, pressure is built until it reaches the value set by the user. Then a piston forces the sample through a fixed orifice at high velocity before it impacts on a cooled heat exchange surface, and then flows through an outlet for collection. ÄKTA pure is a flexible and intuitive chromatography system for fast purification of proteins, peptides, and nucleic acids from microgram to gram levels of target product. Modular system design with a large range of options to allow flexibility in purification of proteins and peptides. Customizable system that is easy to upgrade as your research needs develop. Reliable system with components and integrated features based on the proven design of ÄKTA avant. UNICORN software simplifies your work by providing simple, intuitive, and flexible total system control including drag-and-drop method creation. Predefined method settings for all GE Healthcare lab-scale chromatography columns. ÄKTA flux is a versatile cross flow filtration system for sample concentration and diafiltration as well as cell harvest and clarification. The ÄKTA flux system allows effortless filtrations using cassettes and hollow fiber filter cartridges. 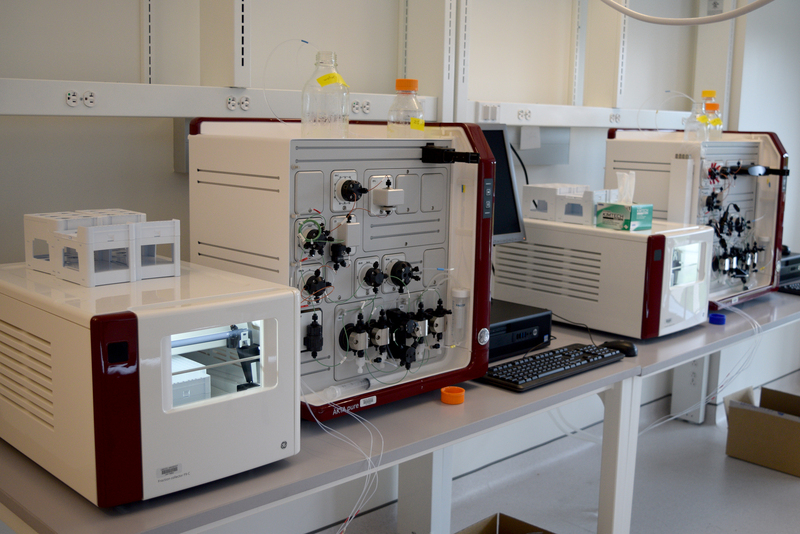 It is available in two versions: ÄKTA flux s for research and filter screenings, and ÄKTA flux 6 for process development and scale-up experiments. The ÄKTA flux filtration system is well-suited for use in protein purification workflows as a complement to the ÄKTA chromatography systems. The single-use ReadyToProcess WAVE 25 bioreactor system is a reliable and intuitive cell culture device for working volumes in the 0.3 to 25 L range. Designed to meet the demands of a regulated environment, the system offers reliable performance, accurate process control, and ease-of-use. The ReadyToProcess WAVE 25 system consists of a rocker (ReadyToProcess WAVE 25 Rocker), control units (ReadyToProcess CBCU), and pumps (ReadyToProcess Pump 25), all operated by UNICORN software installed on a client computer.